Let me just say this: I love cargo pants. In fact, they are my favorites. I love wearing them for shopping travelling and those pockets are so in handy. The more the better J. The thing about them is that they are so versatile and practical and while most women wear them for travel or leisure, they can also be dressed up and look very polished. Read below my three easy-to-follow style tips. Whether you pick a skinny or a more relaxed fit, pair them with a more stylish top, instead on your usual t-shirt or tank top. Experiment with silk or linens. The one I am wearing is a linen shirt, one of my other top favorite things to wear in summer. It is cool, love the texture and the tie option makes it so interesting (I can tie it in the front or back) especially because the ties are so wide and they create the effect of a corset. Wear them with single strap sandals (or other sandals with thin straps ) to introduce some feminine element), or pointy toe heels, like I did. 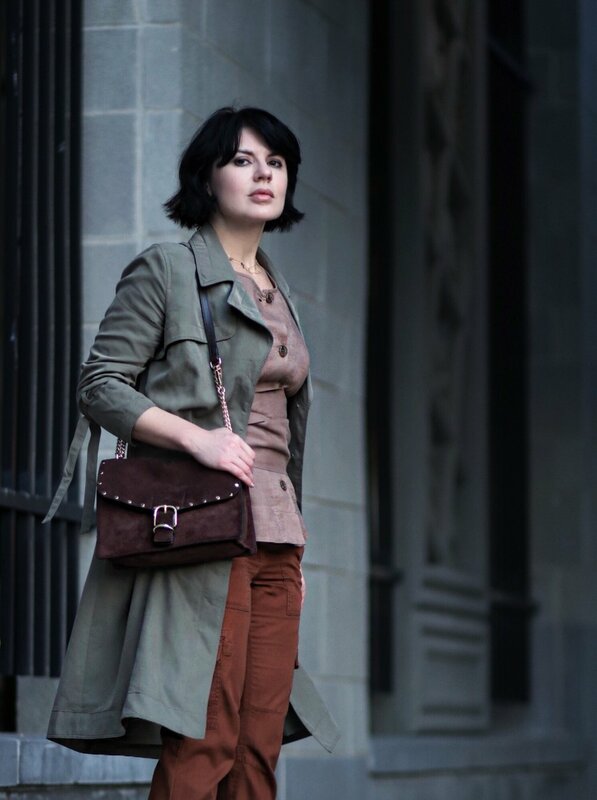 Try some earthy tones for your shoes and top, like the tones I used (camel and tan) or experiment with pastels. A pink-red combo would be very interesting and very much now.